United for Peace of Pierce County - BACKGROUND: Are we going to Scarborough Shoal? BACKGROUND: Are we going to Scarborough Shoal? China has backed its expansive claims with island-building and naval patrols. The U.S. says it does not take sides in territorial disputes, but has sent military ships and planes near disputed islands, calling them "freedom of navigation" operations to ensure access to key shipping and air routes. 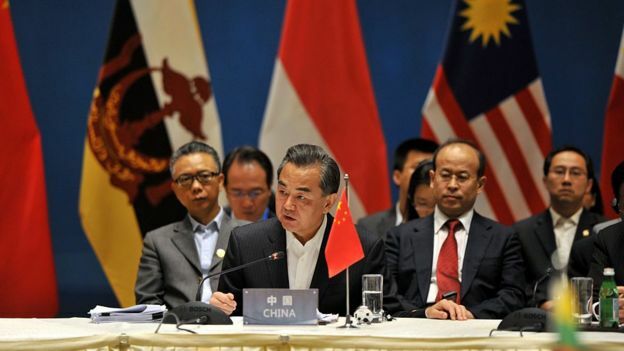 Both sides have accused each other of "militarizing" the South China Sea. 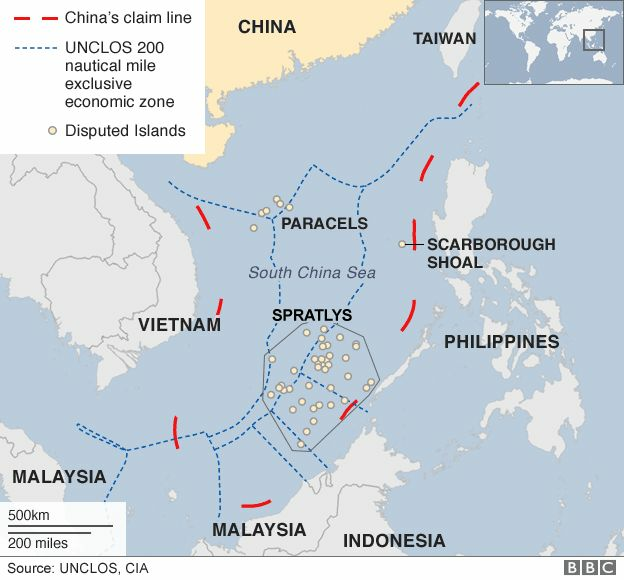 It is a dispute over territory and sovereignty over ocean areas, and the Paracels and the Spratlys -- two island chains claimed in whole or in part by a number of countries. Alongside the fully fledged islands, there are dozens of rocky outcrops, atolls, sandbanks, and reefs, such as the Scarborough Shoal. China claims by far the largest portion of territory -- an area defined by the "nine-dash line" which stretches hundreds of miles south and east from its most southerly province of Hainan. 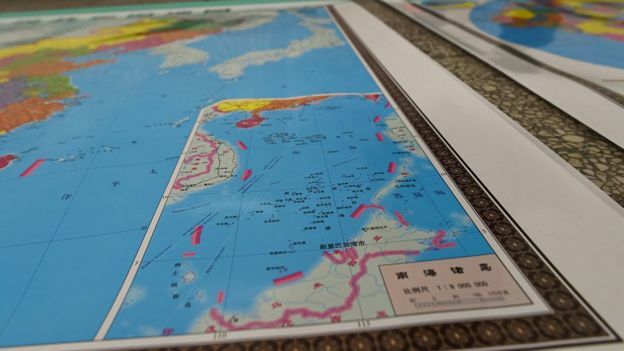 However, critics say China has not clarified its claims sufficiently -- and that the nine-dash line that appears on Chinese maps encompassing almost the entirety of the South China Sea includes no coordinates. Vietnam hotly disputes China's historical account, saying China had never claimed sovereignty over the islands before the 1940s. Vietnam says it has actively ruled over both the Paracels and the Spratlys since the 17th century -- and has the documents to prove it. Both the Philippines and China lay claim to the Scarborough Shoal (known as Huangyan Island in China) -- a little more than 100 miles (160km) from the Philippines and 500 miles from China. Malaysia and Brunei also lay claim to territory in the South China Sea that they say falls within their economic exclusion zones, as defined by UNCLOS -- the United Nations Convention on the Law of the Sea. --In 1974 the Chinese seized the Paracels from Vietnam, killing more than 70 Vietnamese troops. --In 1988 the two sides clashed in the Spratlys, with Vietnam again coming off worse, losing about 60 sailors. --In early 2012, China and the Philippines engaged in a lengthy maritime stand-off, accusing each other of intrusions in the Scarborough Shoal. --Unverified claims that the Chinese navy sabotaged two Vietnamese exploration operations in late 2012 led to large anti-China protests on Vietnam's streets. --In January 2013, Manila said it was taking China to a U.N. tribunal under the auspices of the U.N. Convention on the Laws of the Sea, to challenge its claims. --In May 2014, the introduction by China of a drilling rig into waters near the Paracel Islands led to multiple collisions between Vietnamese and Chinese ships. China prefers bilateral negotiations with the other parties. But many of its neighbors argue that China's relative size and clout give it an unfair advantage. The Philippines has sought international arbitration instead. In 2013, it announced it would take China to an arbitration tribunal under the auspices of the U.N. Convention on the Laws of the Sea, to challenge its claims. In July 2016, the tribunal backed the Philippines' case, saying China had violated the Philippines' sovereign rights. China had boycotted the proceedings, and called the ruling "ill-founded." It says it will not be bound by it. Territorial and jurisdictional disputes in the South China Sea continue to strain relationships between China and other countries in Southeast Asia and risk escalation into a military clash. The United States has sought to uphold freedom of navigation and support other nations in Southeast Asia that have been affected by China’s assertive territorial claims and land reclamation efforts. In the fall of 2015, the United States signaled that it will challenge China’s assertion of sovereignty over disputed territory by flying military aircraft and deploying ships near some of the islands. In recent years, satellite imagery has shown China’s increased efforts to reclaim land in the South China Sea by physically increasing the size of islands or creating altogether new islands. 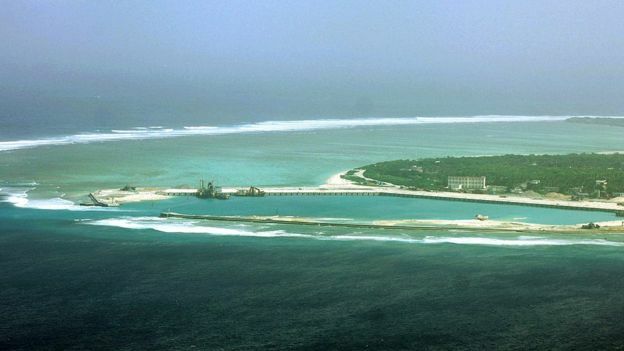 In addition to piling sand onto existing reefs, China has constructed ports, military installations, and airstrips -- particularly in the Spratly Islands. China’s sweeping claims of sovereignty over the sea -- and the sea’s alleged 11 billion barrels of untapped oil and 190 trillion cubic feet of natural gas -- have antagonized competing claimants Malaysia, Vietnam, Brunei, Taiwan, Indonesia, and the Philippines. As early as the 1970s, countries began to claim as their own islands and various zones in the South China Sea such as the Spratly islands, which may possess rich natural resources and fishing areas. Since President Barack Obama took office in 2008, his administration has made achievements in both domestic and foreign affairs. In terms of politics and diplomacy, he is committed to become a peaceful president through conducting smart power diplomacy, which so far has included promoting his vision of a world free of nuclear weapons; ending the war in Iraq; accelerating withdrawal of forces and the end of military mission in Afghanistan; restraining U.S. involvement in Libya and Syria; championing the Iran nuclear deal framework; and normalizing relations with Cuba. However, in contrast to his policy trends and preferences, which tend toward contracting U.S. strategic commitments overseas, the U.S. has conducted a strategic expansion in the Asia-Pacific, which is evidenced by its deep involvement in regional security issues. Unfortunately, with the country immersed in domestic concerns, the White House’s attention to regional affairs is limited. Coupled with a lack of staff who have a deep understanding of Asian culture, “hawks” and the military have come to dominate East Asian affairs in the past few years. As a result, U.S. security policy aimed at de-escalating conflicts and tensions has been ineffective and even counteractive, as reflected by the case of the South China Sea (SCS). To be frank, the “combo punches” have been effective to some extent, but whether in the expected way is doubtful. The truth is the United States has overreacted due to the two misjudgments mentioned above. This approach not only humiliates China, but also forces Beijing to counterattack. What’s worse, it further raised tensions and increased Sino-U.S. conflicts. It is really the Obama administration’s strategic goal to threaten peace and development in East Asia? In response to a rising China, Obama initiated the idea of a “G2” early in his presidency in 2009, yet Beijing was not prepared for this role and did not react to this idea. Later, the United States adopted its “rebalance to Asia” strategy due to the changing security situation in the Asia-Pacific. It conducted a series of measures to balance China in the western Pacific Ocean. In the north, it strengthened the U.S.-Japan-South Korea trilateral security and military cooperation using the excuse of North Korean threat; in the middle, it urged China and Taiwan to make big concession in the South and East China Seas, (particularly focusing its efforts on the Tsai administration in Taiwan); while in the south, it consolidated the U.S.-Australia alliance and increased the U.S. military presence in this region. Meanwhile, the U.S. strengthened military cooperation with ASEAN using the excuse of the SCS disputes. This cooperation includes U.S.ally, the Philippines, quasi-ally Singapore, partners Indonesia, Malaysia, and Brunei, and also its former rival, Vietnam. Some Chinese researchers hold that the United States is containing China, at least in the security aspect. However, I argue Washington is seeking to counterbalance China rather than contain it. After all, the U.S. has strengthened its cooperation with China in the economic, cultural, educational, and scientific fields. If Washington chose to contain China on security issue, this would effectively mean the U.S. is financing its rival, which is neither reasonable nor effective. As an experienced hegemon, it is unlikely that the United States would adopt such a contradictory strategy. Instead, it’s more likely that Washington believes that regional peace and stability rely on the balance of power, and it is the U.S. responsibility and interest to play the role of a balancer. Thus preventing and balancing a rising China and maintaining freedom of military navigation is a realistic choice for Washington. The U.S. considers China to be breaking the balance of power in the Asia-Pacific. On one hand, China’s recent growing assertiveness in the SCS has caused concerns in ASEAN, particularly among ASEAN claimants. They chose to side with the U.S. for security reasons. On the other hand, Washington itself felt its military activities in other countries’ EZZ and territorial waters were under threat. Once China’s expanding naval power gave it the capability to carry out anti-access and area denial, the United States would have to give up military activities in these waters, a situation which even the Soviet Union could not achieve during the Cold War. As a result, the U.S. increased its military support to ASEAN, especially ASEAN claimants, and meanwhile urged China to restrain itself and increase its military transparency in the SCS. When Washington found this approach to be ineffective, it changed course to conduct further measures. The SCS dispute has evolved into three-layers: the U.S. and China; China and ASEAN; as well as China and ASEAN claimants. Six parties are involved in the disputes over the sovereignty of these maritime features; while in terms of maritime delimitation, seven parties (including Indonesia) are involved. From the perspective of great power politics, the United States and China are major players; in contrast, ASEAN and the claimants are less significant and tend to follow the U.S. agenda. In this case, SCS is more of a political and strategic struggle than a legal and economic issue. That is the reason for the great power politics between U.S. and China in the SCS. From 2009 to 2013, U.S. has manipulated the SCS issue behind the scenes, (see, for example, its reaction to the Scarborough Shoal incident of 2012). Since the HD-981 oil rig incident in 2014, Washington changed its role to become a player, as shown when U.S. Defense Secretary Chuck Hagel openly criticized China in that year’s Shangri-La Dialogue. Later, the U.S. determined to fight with “combo punches” due to China’s large scale land reclamation. This “combo” includes taking full advantage of the Philippines’ arbitration case; emphasizing freedom of navigation operations (FONOPs) at every chance; inviting more countries to participate in joint patrols; and dialing up on the volume on international organizations’ (such as ASEAN, G7, and the EU) and big powers’ (like Japan and India) voices on the SCS disputes. 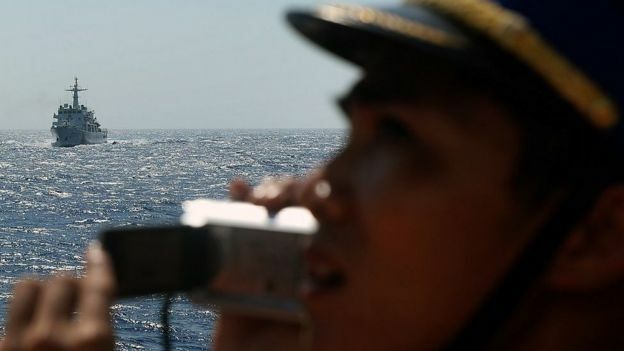 These approaches aim to delegitimize the nine-dash line and China’s historical claims, to create a “donut” in the SCS -- that is, narrowing maritime rights within 12 nautical miles or even 500 meters of occupied maritime features. This series of actions created a new reality and new rule, which the U.S. forced China to accept. Otherwise, China would have to pay dearly in international society, where China would be portrayed as a “bully” state that undermines peace and stability in the SCS, destroys natural resources and the environment; a lonely power who does not abide by international law. As an experienced hegemon, the U.S. has distinguished strategic planning capabilities. The “combo punches” mentioned above are very effective at pressing China on multiple fronts: international law and international public opinion; physical control of the waters; China-ASEAN cooperation and the progress of a code of conduct (CoC). The arbitration verdict was also harmful to China’s international image, efforts for peaceful rise, peripheral diplomacy and relations with ASEAN, as well as the new type of great power relations with United States. However, from China’s perspective, the U.S. is undoubtedly the driving force and major manipulator behind these negative consequences. What’s worse, the U.S. military is challenging the principle of civilian control of the military. Senior military officials continuously comment on the SCS, making remarks that should be delivered by diplomats. For instances, while not naming China, U.S. Pacific Fleet Commander Admiral Scott Swift said some countries were bucking international rules and creating chaos after more than 70 year of stability; Commander of Pacific Command Admiral Harry Harris accused Beijing of being responsible for the tensions in the SCS and hinted that the U.S. should be ready to go to war. The military’s top commanders in Pacific are lobbying the National Security Council for a more confrontational approach to China, like Harris’ advocacy for more muscular patrols and Japanese engagement. It recalls the days of General MacArthur. Here, it’s worth mentioning an episode from 2015. On November 13, Representative Nancy Pelosi and her congressional delegation had lunch with several Chinese scholars. During the meeting, she noted that Chinese naval fleet traveled through the Strait of Tanaga when Obama was in Alaska. Pelosi was quite concerned about the patrol. So how to explain why the U.S. sent the USS Lassen to within 12 nm of Subi Reef during China’s fifth plenum in October 2015? If, as per Pelosi, China’s transit near Alaska was aggressive due to Obama’s presence in the state, the timing of the USS Lassen’s operation was much more provocative. What’s more, which article of international law says FONOPs should be carried out according to the interpretation of the travelling state? FONOPs within 12 nm of a feature can only be conducted according to either innocent passage or transit passage. When it comes to innocent passage, the state in control of the territorial sea can choose to require non-notification, notification in advance, or approval in advance. China, as the controlling state of the features in question, requires approval in advance. It is reported the U.S. warships operate in accordance with China’s domestic law within 12 nm of China’s coastal line, but apparently deliberately chose not to do so in the SCS. In this regard, the so called FONOPs by USS William P. Lawrence and Curtis Wilbur not only misinterpreted international law, but also intentionally violated China’s domestic law and deliberately humiliated China. Defense Secretary Ash Carter visited the USS Stennis in the SCS this April. Compared with his trip to the waters near Malaysia last year, this trip was more provocative and contemptuous. The message it sent to China was: “I’ve come back again; what can you do about it? Do you have the capability to patrol in U.S. waters?” Afterwards, the U.S. request for a port visit to Hong Kong was inevitably refused by the Chinese government. It is quite interesting that the U.S. expected such a privilege after humiliating China. Reports suggest that the U.S. military plans to conduct two FONOPs in the SCS every quarter. The USS William P. Lawrence’s patrol on May 10 within 12 nm of Fiery Cross Reef should be counted as the first operation. In response, China “monitored, followed and issued warnings to the U.S. vessel,” according to the Foreign Ministry. A patrol near Scarborough Shoal or Mischief Reef is likely to be the second operation in this quarter. Washington’s think tanks and media have hyped the idea that China is going to build an outpost on Scarborough Shoal, a land reclamation operation much larger than other Chinese projects in the Spratlys. The U.S. military is preparing for this operation by flying over Scarborough Shoal. From the U.S. perspective, this operation is a kind of warning; in China’s view, it is both a threat and humiliation. In the eyes of most other countries, FONOPs, introduced in 1979, serve as a tool for the United States to expand its maritime interests based on its naval force and legitimize its unreasonable claims. Obama, commander-in-chief of the U.S. military, is not an aggressive president. He reportedly refused some proposed FONOPs, yet approved a few of the operations when lobbied by the military. The consequences and effectiveness of these operations are questionable. The fact is since October 2015 the muscular actions continuously provoked and humiliated China and forced China to react. The patrol may please those who want to see an expanded military budget; however, it deeply hurts the Sino-U.S. relationship, increases the tensions in the SCS and hinders more realistic solutions (like the negotiation of a CoC). In part, these counterproductive U.S. actions are driven by a misunderstanding of Chinese actions and goals in the SCS. Part II of this piece, coming tomorrow, will examine China’s stance in the SCS and its response to U.S. actions. --Dr. Xue Li is Director of Department of International Strategy at the Institute of World Economics and Politics, Chinese Academy of Social Sciences. Xu Yanzhuo received her doctorate from Durham University (U.K.) in December 2014 and studies international responsibility, the South China Sea disputes, and Chinese foreign policy. The editorial followed the July 12 ruling by the Permanent Court of Arbitration (PCA) in The Hague supporting virtually all of the U.S.-sponsored Philippine case challenging Beijing’s maritime claims, including China’s “historic” right to much of the South China Sea. Beijing, which did not participate in the court proceedings, has declared that it will ignore the PCA decision. For the past 18 months, Washington has mounted an increasingly shrill campaign against Chinese “expansionism” in the South China Sea, citing land reclamation and “militarization” in particular. The U.S. Navy has conducted three “freedom of navigation” operations (FONOPS) by sending destroyers within the 12-nautical-mile limits of islets under Chinese administration. The Global Times, however, singled out Australia, pointing out its “inglorious history” in relation to Aborigines, and its hypocrisy in relation to the U.N. Convention on the Law of the Sea (UNCLOS), under which the Philippine case was heard. It highlighted Australia’s territorial claims in Antarctica, which are not widely recognized internationally, and its maneuvering in relation to UNCLOS on its claims to the Antarctic continental shelf. “Australia showed blunt double standards as if no one had a memory of what it did and said over the Antarctic,” the editorial stated. The editorial is not an official statement but the generally hawkish Global Times is owned by the Chinese Communist Party’s (CCP) official organ, the People’s Daily. “I think the editorials of the Global Times are not exactly the Chinese government’s position, but in a way it does reflect the displeasure of the Chinese government,” Shi Yinhong, a Renmin University professor, told the Australian Broadcasting Corporation. Beijing is well aware that the Australian government confronts a dilemma in balancing between its largest trading partner China, and its longstanding strategic ally, the United States. In an implicit threat of economic retaliation, the editorial noted that Australia has signed a free trade agreement with China -- just last year. In the immediate aftermath of The Hague decision, U.S. Vice President Joe Biden visited Australia and met with Prime Minister Malcolm Turnbull and Foreign Minister Julie Bishop, stressing the importance of the long history of Australian support for U.S.-led wars. Undoubtedly behind closed doors, Biden put pressure on Canberra to mount its own “freedom of navigation” operations to intrude into Chinese-claimed territory in the South China Sea. The declaration is not only a measure of the extremely sharp tensions in the South China Sea but also of the political bankruptcy of the CCP regime. It is certainly the case that the prime responsibility for the dangerous situation in the South China Sea lies with Washington, which has recklessly ratcheted up its confrontation with Beijing to sow divisions between China and its neighbors. The U.S. is recklessly inflaming flashpoints throughout the region as part of its “pivot to Asia” aimed at subordinating China to the interests of American imperialism. However, the CCP leadership is incapable of making any appeal to the working class in China or internationally. Instead, Beijing is on the one hand seeking to cut a deal with Washington while on the other whipping up nationalism and engaging in an arms race that only intensifies the danger of war. The Chinese foreign ministry announced last week that China and Russia would conduct naval exercises in the South China Sea in September. While the two navies have held joint war games before, next month’s operations are far from “routine” as claimed by spokesman Yang Yujun. In the wake of The Hague ruling, the US could well seize on the opportunity to once again raise tensions in the strategic waters. Russia has backed China’s claims in the South China Sea. The CCP’s more hawkish elements, such as the Global Times, recklessly suggest a more confrontational strategy, utterly indifferent to the potential catastrophe that a conflict between nuclear-armed powers could bring. An incident involving Chinese and Australian warships in the South China Sea, whether deliberate or accidental, could quickly involve the US and escalate out of control.